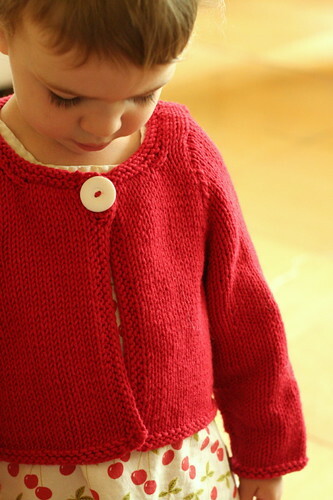 Back in March, I knitted up this lovely little cropped cardigan for Beatrix, aiming to use up some cotton stash along the way. I wrote up the pattern with the intention of publishing it here; then, I got pregnant. Yes, you read that right, I got pregnant and lost all interest in knitting, sewing, and crafting of any kind. Once I stopped puking my guts out, I sent the pattern off to Elizabeth of Sweet Paprika Designs for tech editing. It’s back just in time for the start of pre-school! 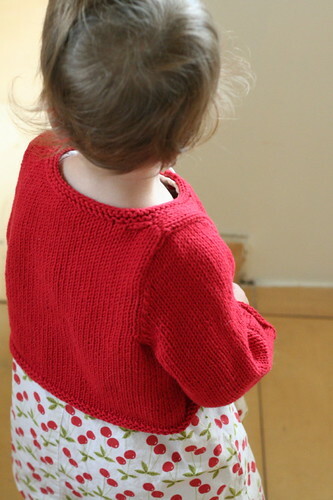 The garment is worked flat in one piece to the armholes and joined at the shoulders by three-needle bind-off. 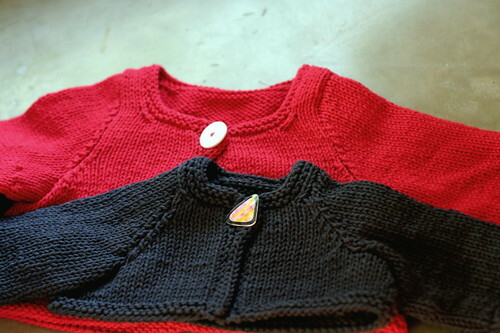 The sleeves are worked in the round to the armholes, then the sleeve cap is knitted back and forth and sewn in. Beatrix is absolutely enamored of the button. I also knitted up the 3 mos size to check my numbers. The difference between 3 months and 3 years is striking, don’t you think? I hardly remember Beatrix being that small. I’m back to knitting now. Who knows what brought it on? Autumn or the third trimester on the horizon? I’m grateful for whatever it was. 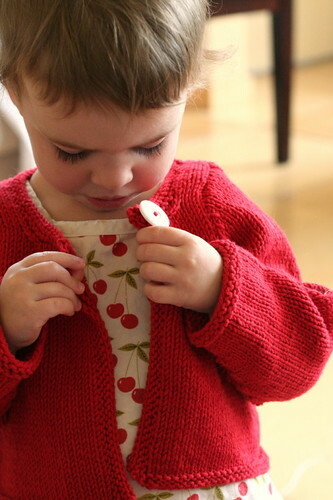 There will be more stashbusting projects for little people in the weeks to come. Stay tuned.